She is a sailor, and Ashiru's ship captain. She used to be a pirate, along with the rest of her crewmen. She was determined to become Ashiru's concubine, but this was due to her being indebted to him somehow, and not because of romantic feelings for him. 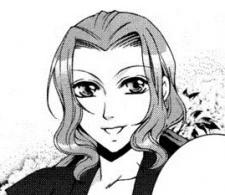 She comes to accept Ashiru's love for Hina and the fact that Ashiru wants no concubines, but only Hina. She ends up establishing a friendly relationship with Hina.